Rugby students were very excited to have an opportunity to have their photo taken with the Rugby World Cup (officially the Webb Ellis Cup) last week! This is the very same Cup that Richie McCaw held up after the All Blacks overcame Australia in the Rugby World Cup final on 31 October 2015. 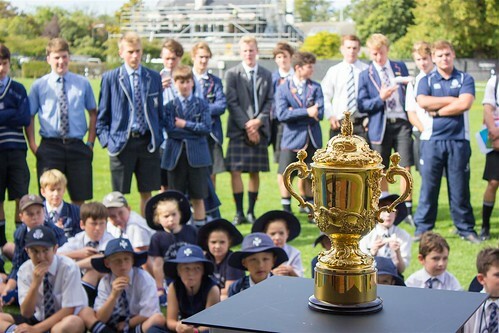 Officials from the NZRU brought the cup along for our rugby players’ registration day and told students about its history. One lucky student from Year 10 was chosen to actually hold the cup – a special tradition mostly reserved for the Rugby World Cup winning team. on one handle there is a head of a satyr, on the other there is head of a nymph.